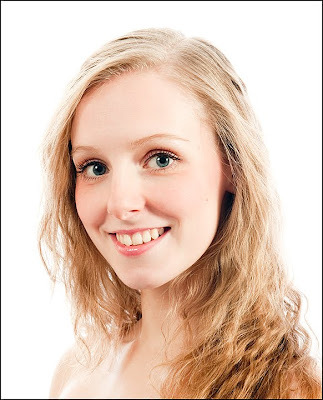 BALLET NEWS: Amy Coughlan interviewed for "Cupcakes & Conversation ..."
Amy Coughlan interviewed for "Cupcakes & Conversation ..."
I awake each morning to my alarm playing ‘Hey There Delilah’ by the Plain White T’s. It is one of my favourite tunes and calms me for my day ahead; also you can't beat a good breakfast and listening to a bit of music. I am looking forward to the challenge of learning a variety of roles and putting in practice what I have been working towards for the past three years. It will be fun working with other Company members and travelling to many different venues around the UK and Wales – I am sure we will have a few tales to tell between us! I must admit being paid to dance is an added bonus. I would love to have the chance to dance with either Edward Watson or Eric Underwood. After the ritual of sewing the ribbons and elastics, I bend the back of my pointe shoes with my hands and carefully stand on the block to soften and slightly flatten the block. Finally, I walk around on demi-pointe followed by slow rises and relevés. At the moment I work for a temping Agency and my assignments so far have been working at Harrods. I try and attend ballet classes at Pineapple as often as I can. Johnny Depp, well what can I say…….! My culinary skills, as I really enjoy a good cooking session to see what I can create and my enjoyment of mathematics; except if it involves a spreadsheet. Moira Shearer inspired me to dance after watching her in ‘The Red Shoes’ at the age of 4. From then onwards I was determined to become a ballet dancer and own a pair of red pointe shoes; I finally received the red pointe shoes for my 21st. Just recently have been described as approachable, friendly and that I always have a smile on my face. Believe in yourself and don’t let others knock you down. Before joining Central (School of Ballet) I performed the ‘Scottish Reel’ from ‘Les Sylphides’. We practised and practised and then one time for a performance we all came out on stage, the lights came up and everyone was there on stage with their partners but me, I looked to the side of the stage and there he was looking at me and waving!! At the time it wasn’t funny but when I joined Central I had to laugh as the first dance we learnt in our Dance Studies sessions was………'Scottish Reel'!!!!! I’m also very well known for my blonde moments! I’d like to design the costume Darcey Bussell wears for Elite Syncopations but in a shade of purple with purple pointe shoes! It's such a sophisticated and stylised costume and I am obsessed with the colour purple! Being accepted into Central School of Ballet and graduating into a professional Company - Ballet Theatre UK. It would have to be Kate Hudson. I suppose my arabesque. I am told I have a lovely clear, good, classical line. Performing Titania’s solo from George Balanchine’s ‘A Midsummer Night’s Dream’ for my graduation solo. I do but it’s a secret!! I love her picks for dinner. Elise, what a wonderful interview. I have always admired the way dancers live their lives with such discipline and dedication. Amy is adorable, xv. 21 sounds old to get her first pair of pointe shoes - good for her to have got where she is. Thanks for visiting me on my blog. I am so glad to meet you! I have always been fascinated by ballet but never knew anything much about it. This is a beautiful site and a great way to learn more about the artists behind the performances. I will be back soon. I love your blog. What a wonderful source of inspiration! I am going to share it with our 8 year olds and 6 year old! In fact, our 6 year old has ballet today! It teaches such grace and discipline. Thanks for your visit!!! I love ballet. I´ll visit you again. I can't wait until my little A is old enough to attend ballet classes. Your blog and interviews are wonderful. It is very interesting to know a dancer's life and mind. My sister has been enjoying ballet as her hobby for 30 years. She is not a professional but she loves ballet. Also all the pictures in your blog are beautiful. So wonderful to read all the fun facts about these beautiful,disciplined & talented ballerina's. This would be a great source of info. & inspiration to share with your young "nspiring to be" ~ Ballerina's. Thank You so much for your wonderful words on my blog! We know this young lady very well and yes she is truely adorable. Thank you for your visit. You have a lovely blog. My dauther loves ballet and we´ll see you. Hi Elise! Nice to meet you! Thanks for stopping by my blog! Beautiful Ballet!My 12 ye old is a dancer...Jazz and hip hop. She has taken dance since pre-school. We just love all forms of dance! Thanks so much for visiting my blog! Hope you continue to read. Love what you've done as well. I always wanted to be a ballerina! Hola Elise! muchas gracias por visitar mi blog. Me parece muy interesante el tuyo, siempre me han llamado mucho la atención las imagenes de bailarines. Te felicito !! Hi there! Thanks so much for stopping by my blog and saying "hi"! Gosh, I haven't been to a ballet in years. Reading through your blog though makes me remember all the things I loved about it. You do such a beautiful job! I loved all the gorgeous dance photos and it was so interesting to read the interviews. Elise thanks for wishing me better on my blog, great piece today enjoyed reading it. Thanks so much for visiting my blog today and nice to meet you! COOL BLOG :-) Thanks for visiting mine! I love your posts and i love dance! I miss dancing!! I grew up every weekend in a school of dance. And a dinner with Johnny and Jamie? How can I get an invitation!? These interviews are great, although they make me want to get back in to my adult ballet lessons (8 months pregnant is not the best time to be dancing!) My daughter really wants red pointe shoes too! Those are gorgeous pictures and a great article. I love reading about the arts. Thanks for visiting my blog and leaving a comment. I hope to hear from you more! wow! you have such fabulous blog, I just found you! Perhaps Amy needs a trip to Brympton we never know who will appear next her wish list sounds like our wish! Thank you for coming to my blog! I appreciate your comments. Your blog is fantastic! I will read more!! Thanks for coming to say hello on my blog, yours is lovely! my niece just recently started ballet and I wish I could go with her...I used to teach hiphop...quite a bit different, always wanted to take an adult class, Im just too afraid haha! A beautiful blog & a beautiful dancer!! I admire all dancers for their discipline and dedication, and of course the beauty and grace.. There was a time when I wanted to be a ballerina too, that time is loong ago though! :) It's good to read about other's experiences though!! might inspire me to go dancing again, on a smaller scale of course!! dinner with johnny dep...yes please!!! haha. my kind of gal. thanks for stopping my bloggy. you're so sweet!!! Thank you for coming by for a visit. I adore yours!! Will be back again soon. Thank you so much for your kind comments on my post Elise. And what a beautiful blog you have here. Thank you fot the comment on my post! Nice interview with Amy Coughlan! Elise, are you from the UK or from the US? Have you ever been in Belgium to write something of Belgian ballet dansers? Just Breathe - great aren'y they ? vicki archer - thank you so much for your lovely compliment. Flowerpot - I think Amy meant that she got her first RED pointe shoes at 21 - not her first ever pointe shoes. It was the red ones she especially wanted and they are not routine - they are usually pink. Butterfly - I hope you do go - I'd like to follow someone who does adult ballet classes. Please keep me posted ! Kitschen Pink - Well there you go - dancers do all kinds of things ! Henley on the Horn - thank you so much. The dancers are inspirational aren't they ? daisychain - too kind - and I love being called "doll" ! Akuka - good to hear, welcome ! Lisa Renata - thank you for the compliment. I hope you keep us posted ! Ela - thank you, too kind ! A. Morgan - Please don't apologise - your English is fine. Welcome ! peggylee - thank you ! Anne - I'll see what I can do !! Miss Mustard Seed - what an apt name you have there ! thank you and welcome ! Sassy Scribbles - thank you for your comments - that's exactly why I do the interviews so it's great to hear that they are working for you ! Cindy Lee - thnka you so much. Hope you continue to enjoy and soon you'll be hooked ! susan - thank you ! Manon Doyle - thank you, and welcome. You have a very apt name for the ballet ! Jana - I really hope you do find an adult class - I don't think you should be afraid - they are really popular now and quite hard to find actually, but everyone is lovely and you'll make loads more friends and have a whale of a time. Please keep me posted ! Layla - You are in good company here - thank you ! Greet - thank you. No I've never covered the Belgian dancers. Why do you ask ?